After a thrilling conclusion to our Tournament of Champions, we’re back to regular play tonight. Will we see a tiebreaker? Here’s the link to watch this evening’s Google Hangout on The Jeopardy! Fan, which included several TOC participants, and me. I’ll talk about Courtney’s Penultimate Wager later on – she missed after going for 2,000, forcing herself to respond correctly to have a shot in Final. Let’s look at the wagers. We’ll take care of the extra dollar at the end. Doug should wager 7,400 to cover Jennifer. Jennifer can wager up to 2,600 to stay above Doug if they’re both wrong. Courtney is still alive, but must get it right, so all-in is the right play. 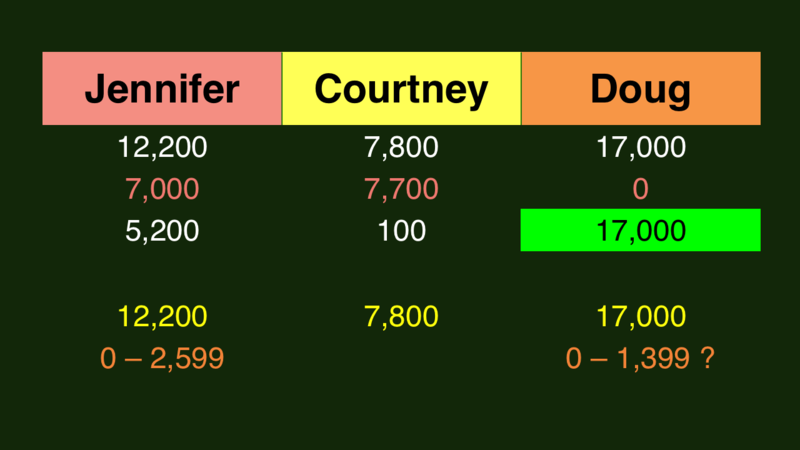 Since we expect Courtney to wager everything, Jennifer should wager 3,400 to cover Courtney. That wager would cause Jennifer to fall below Doug if they both miss, so Jennifer should wager everything if she goes that route. To stay above a double-up by Courtney, Doug could wager up to 1,400. Doug would have won no matter what, but he took his chances that Jennifer would either (1) miss Final or (2) wager small. It worked out. Who are The Spice Girls? 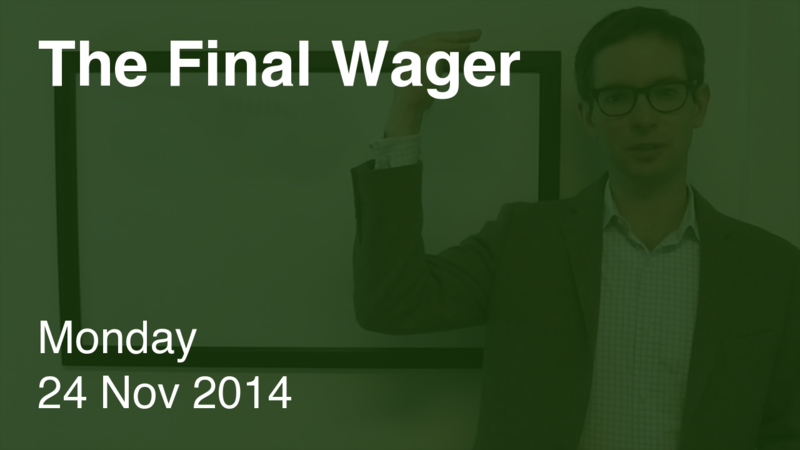 Why should Doug wager it all, if he opts to cover? Doesn’t he want to stay in the 7401-9199 range to force Courtney to get it right to beat him? I mean it might just be a typo, of course. It certainly looks like it, given that the number is not brought up before the “What actually happened” section. Thanks Blake! I am indeed the real Joe and trust me – I knew that game was over (and not in my favor) as soon as Alex said I was incorrect for the clue that preceded the Daily Double. Cooper was/is a fantastic player and he deserved that win just as much if not more, and so it didn’t surprise me in the least that he bet to win and nailed it on both the daily double and in FJ. It was a great game. In culver city. A 10 year old the final wager fan posting this. I got 2 questions answered by alex I encourage a LOT of people to see jeopardy.